Not only is the city’s condo market enjoying a strong recovery these days, but it’s surpassed its pre-recession peak. That’s according to the San Francisco Chronicle, which asserts that there are a number of factors behind the boom. “The frothiness is being whipped by a combination of the robust tech economy, low interest rates and a supply of new condos that is at an all-time low,” the article reads. With less than 100 new units on the market – contrasted with an average of ten times that amount between 1999 and 2009 – crucially low inventory is certainly doing its part to push up interest. In 2013, four major condo projects – Blanc at 1080 Sutter, Linea at 1998 Market, Marlow at 1800 Van Ness and the 300 Ivy Street development – added about 300 units to the pipeline. All except for Linea are sold out; Linea has about a dozen unclaimed units remaining. The Chron notes that the specter of increasing interest rates this year means extra motivation for both buyers and sellers. Currently the rate is 4.30 percent on a 30-year fixed loan – a figure that the newspaper calculates to mean that a monthly payment on a $500,000 loan will be $2,500, as compared to $3,000 per month when rates were 6.10 percent in December 2007. What should you do when your seller insists that Zillow knows better than you do when it comes to pricing? Inman News has tackled this topic and has a few words of wisdom in the bargain. While winning the pricing battle isn’t always easy, you can simplify it. Keep in mind that Zestimates, which is Zillow’s automated valuation model designed to estimate a home’s value, have been irritating to listing agents since Zillow first came on the scene – and are still a bane of listing agents today. Hope this helps with pricing issues! The nation on the whole may have seen a small decrease in the January S&P Case-Shiller report released yesterday, but no one ever said the Bay Area reflects the rest of the country. 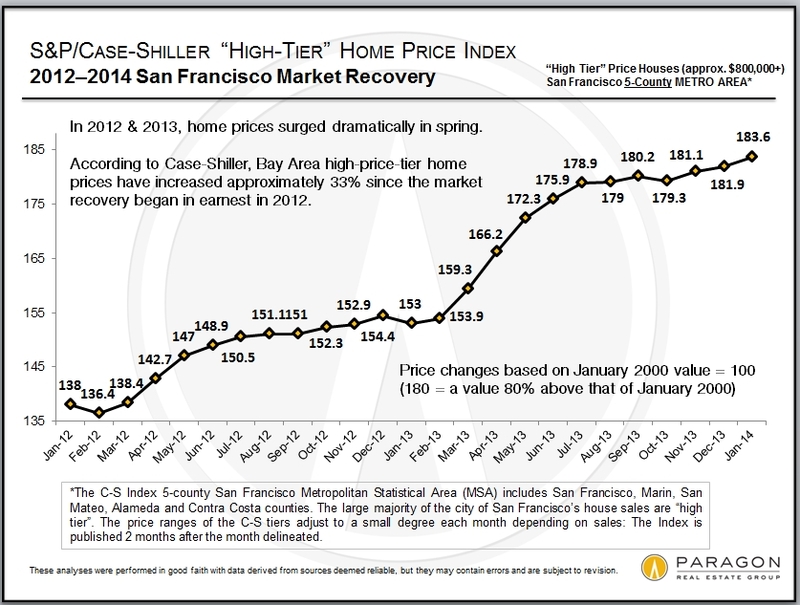 The San Francisco Metro Area Index, which covers five Bay Area counties, bumped up again. At this point, the index for higher-priced homes – which typically covers San Francisco – is at the previous market peak set in 2006. The city has exceeded the rise in the five-county area and has in general bypassed previous peak values. We at Paragon expect to see further increases once the late winter/early spring selling season is reflected in the index. Keep in mind that Case-Shiller always runs several months behind. You’ll find Paragon’s full report here. The chart accompanying this post shows market cycles over the past 30-plus years. Have questions? Give me a call! 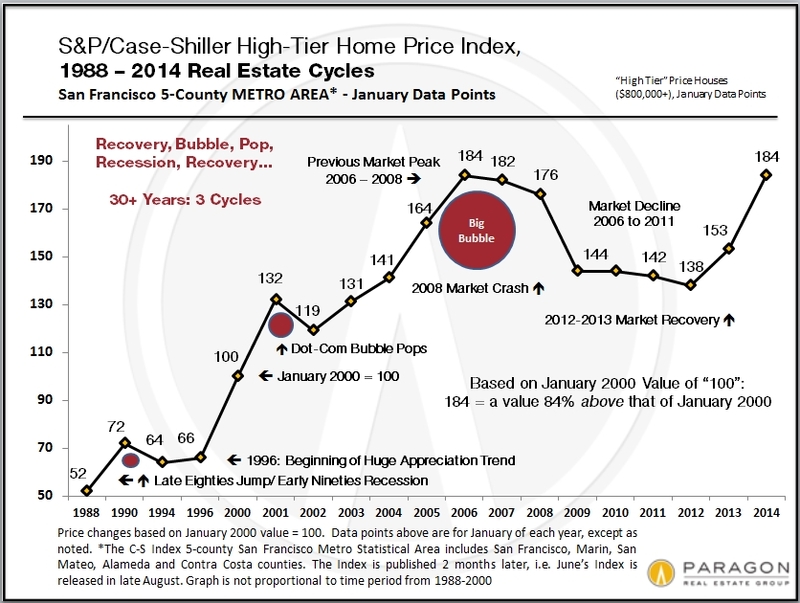 While the nation as a whole saw a tiny decrease in the S&P Case-Shiller Home Price index in the January report released today, the San Francisco Metro Area Index (for 5 northern counties) bumped up again. The C-S Index for higher priced houses has now completely re-attained the previous market peak set in 2006, as measured by January data points. The city of San Francisco itself has exceeded the rise in the 5-county area and has generally surpassed previous peak values – many SF neighborhoods by substantial margins. Based upon what we are seeing on the ground, we expect to see further increases once the late winter/early spring selling season is reflected in the Index. This first chart shows market cycles over the past 30 plus years. The second chart shows appreciation since our current market recovery began. This chart tracks the most recent market recovery which began in earnest in early 2012. In both 2012 and 2013, the spring seasons saw substantial jumps in home values. We recently thought the likelihood of yet another significant jump in 2014 to be relatively low, but the market we’re seeing on the ground – a very high demand/very low supply dynamic – is leading us to suspect otherwise. Case-Shiller measures a 5-county metro area comprised of San Francisco, San Mateo, Marin, Alameda and Contra Costa counties. The numbers used relate to a January 2000 value of 100; thus 184 signifies 84% home price appreciation over the past 14 years. The Index is published 2 months after the latest monthly reading, i.e. the January Index has just been published today, March 25th. With a WalkScore of 95 and a location just off Fulton west of Masonic, 15 Loyola Terrace lies in the heart of bustling San Francisco. Despite that, you’ll find peace within these walls, just as you’ll find excitement when you leave your front door. This elegant house-like condo is a 1920s flat with an unusual floor plan. You enter into a foyer flanked by a gracious living room overlooking the street and dining room overlooking the charming back yard. It features two bedrooms plus a sunroom along with a single bath, one-car parking, deeded storage and location on a picturesque cul-de-sac. The lower unit of a two-flat building, 15 Loyola Terrace has a private garage and hookups for a washer and dryer. This hidden corner of the city offers easy access to Golden Gate Park, Laurel Village and the Haight. Residents enjoy discounted membership to the state-of-the-art Koret Health and Recreation Center at the corner of Fulton and Stanyan. This property is offered at $899,000. For more information, visit www.15Loyola.com or get in touch! Recent research by Paragon Real Estate reveals that condo sales in the city now outnumber house sales. This trend will only get stronger as new condo developments are built – and most striking among those projects are the series of mid-rise buildings lining Market between Gough and Noe. With very few houses built new in San Francisco, they generally simply replace older homes. Paragon has found that there has been a decline in sales for TICs and 2-to-4-unit buildings. This is happening for a variety of reasons, including financing issues and complex tenants’ rights and eviction issues. Thus, existing TICs are still a hot item, but fewer buildings are converting to TIC units. Two-to-four-unit buildings, when available, are still a desirable commodity for the investor market. See the link above or the graph accompanying this story for more information. Looking for a break from the ordinary? Head to the Great American Music Hall this Saturday, March 22, where contemporary blues-rock band Tommy Castro & the Painkillers will be laying down the sounds for all to enjoy. Saturday’s live performance will celebrate the release of the band’s new Alligator Records album, The Devil You Know. Renowned for a signature type of tough rock and heartfelt blues, Castro is now stripping his music down to an essential base as he enters his career’s new phase. Join the band and watch the transition! Tickets are $20 and the show starts at 8. Enjoy! Looking at a slightly higher price point? When last we met, we discussed neighborhood affordability. Today let’s continue that discussion at a slightly higher price point. If you’re looking to spend $1 million to $1.5 million, you may consider a large circle of neighborhoods in the center of the city, plus the Richmond District in the northwest. Within this circle, you’re typically going to get more for your money in the Sunset, Central and Outer Richmond, Miraloma Park or Bernal Heights than in Glen Park or Potrero Hill – or especially Noe or Eureka Valley. The chart accompanying this story spells this out in greater detail. Topping that chart is the Miraloma Park/Midtown Terrace/Forest Hill/Westwood Park area – if you’re looking for value, you’ll find it here. Need guidance? Give me a call! Which neighborhood best suits your financial picture? Think about how much you’re looking to spend on a home. This is going to dictate the types of neighborhoods you’ll be able to seriously investigate. However, it doesn’t as much dictate this when it comes to condos and TICs, other than sales in the luxury segment, since generally speaking, in neighborhoods with wide numbers of condo and TIC sales, there are more plentiful buying options. 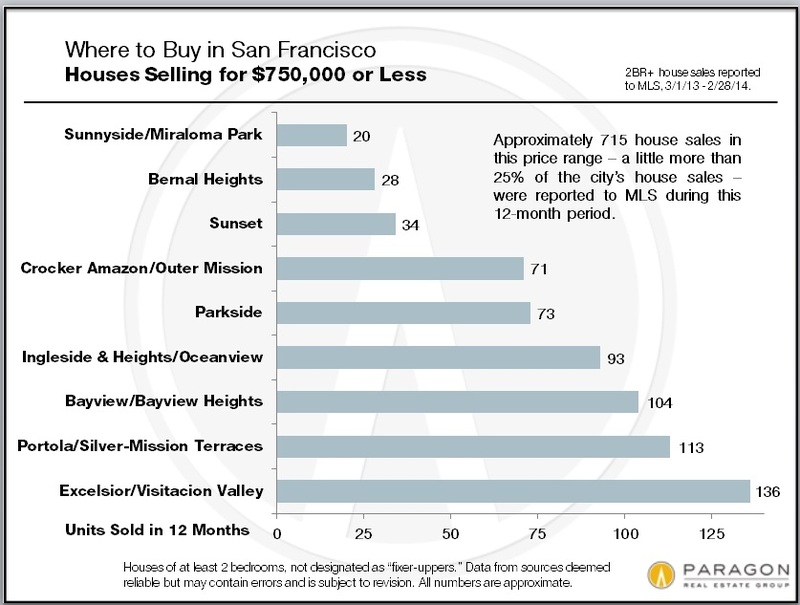 Of the approximately 2635 house sales in the past year, about half sold for less than $1 million; most of these were in neighborhoods forming a large L shape down the west side of the city from the west side of the city, down the Outer Richmond to the border with Daly City, and then sweeping east across the southern side to Bayview and Hunter’s Point. In these neighborhoods, homes began their market recovery a step or two behind more expensive areas in the city, but now they are red-hot and very competitive. 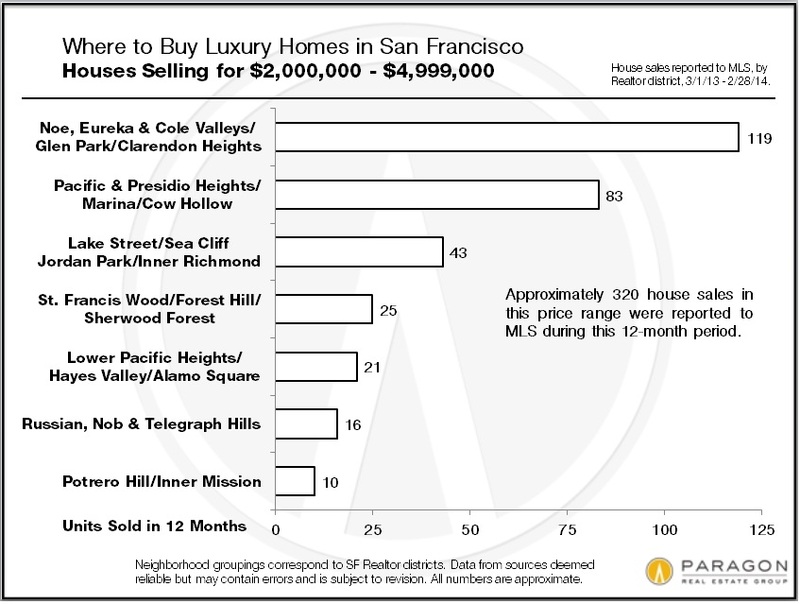 The chart accompanying this article depicts where to buy in San Francisco for $750,000 or less. Tomorrow we’ll discuss more expensive properties. You want to buy a house in San Francisco for under a million dollars, or for over $2 million, or you have $1,800,000 to spend on a luxury condo with a spectacular view. If you’re buying a house in San Francisco, your price range effectively determines the possible neighborhoods to consider. That does not apply quite as much to condos and TICs, except for sales in the luxury segment: generally speaking, in neighborhoods with high numbers of condo and TIC sales, there are buying options at a wide range of price points, though, obviously, size and quality will vary. Also, all the new condo projects being built in many different areas of the city is changing the neighborhood pricing dynamic for condos. The charts below are based upon sales reported to MLS in the 12 months between March 1, 2013 and February 28, 2014. We’ve broken out the neighborhoods with the most sales within given price points. There are exceptions to neighborhood norms scattered throughout the city and in an appreciating market these price ranges having been moving upward. Out of the approximately 2635 house sales in the past year, about 50% sold for under $1 million. 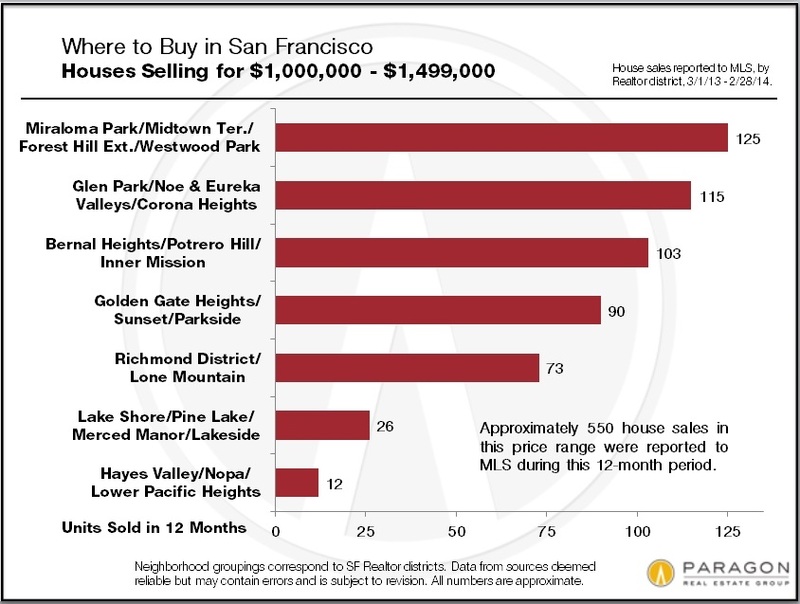 The vast majority of these sales occur in a large swath of neighborhoods forming a giant L shape, down the west side of the city, from Outer Richmond to the border with Daly City, and then sweeping east across the southern side of San Francisco to Bayview and Hunter’s Point. Generally speaking, the western and central-ish neighborhoods cost more than the southern neighborhoods in this under $1m house market. In this price point, one moves into a big circle of neighborhoods in the middle of the city plus the Richmond District in the northwest. 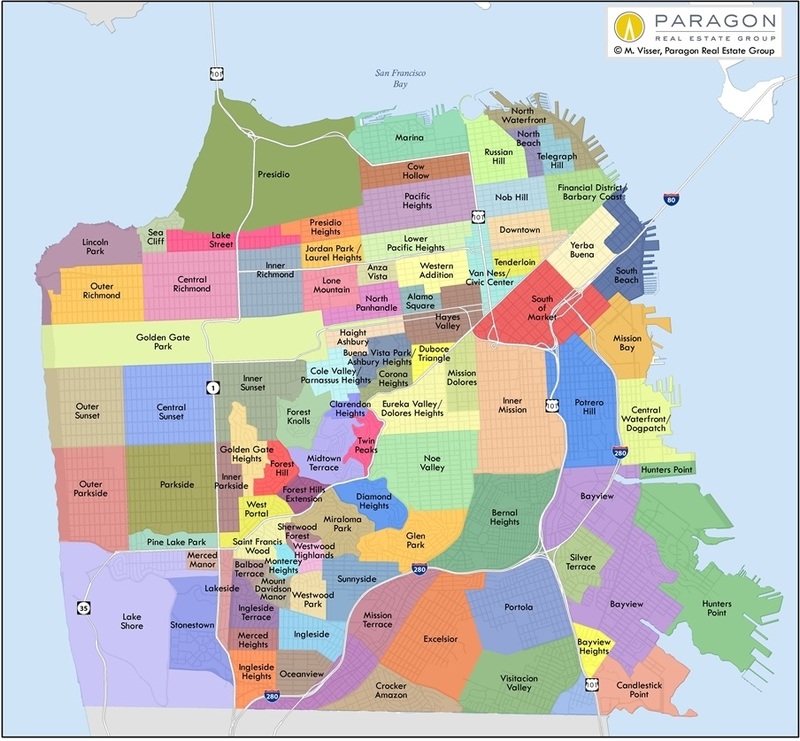 Within this circle, one will typically get significantly more house for one’s money in the Sunset, Central and Outer Richmond, Miraloma Park or Bernal Heights than in Glen Park or Potrero Hill, or especially, Noe or Eureka Valley. 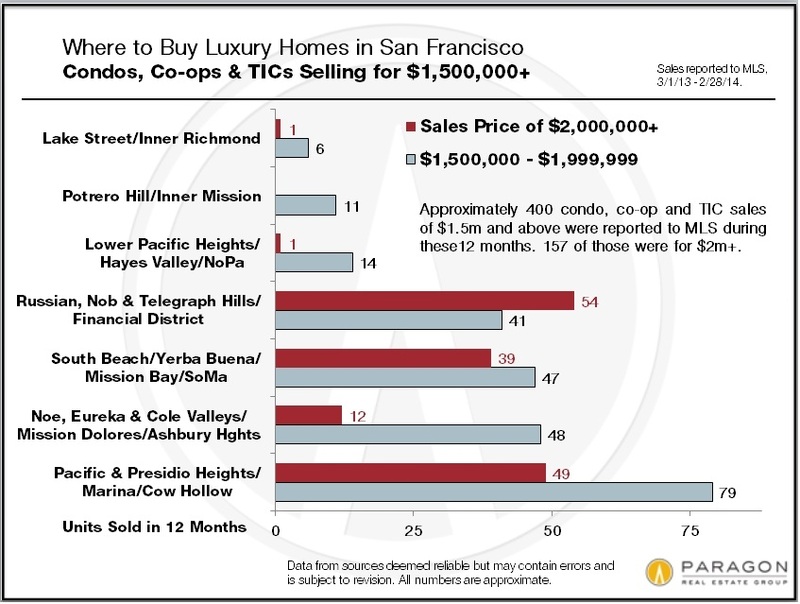 Rather arbitrarily, houses selling for $2 million and above, and condos, co-ops and TICs selling for $1.5 million and above are designated as luxury home sales in San Francisco: these homes now make up about 14% of total home sales (up from about 10-11% a few years ago). Once again, what you get in different neighborhoods for $2 million can vary widely – a large, immaculate house in one place, a fixer-upper in another. With the construction of new high-end, high-tech-amenity condo projects on Market Street and Van Ness, and in neighborhoods like the Inner Mission, Hayes Valley and Inner Richmond — often selling for more than $1000 per square foot — luxury condos are now spreading into new areas of the city. It wasn’t so long ago that houses selling in Realtor District 5, the greater Noe/Eureka/Cole Valleys area (which includes Clarendon, Corona and Ashbury Heights), for over $2 million were an exception. But that is certainly not the case any longer. 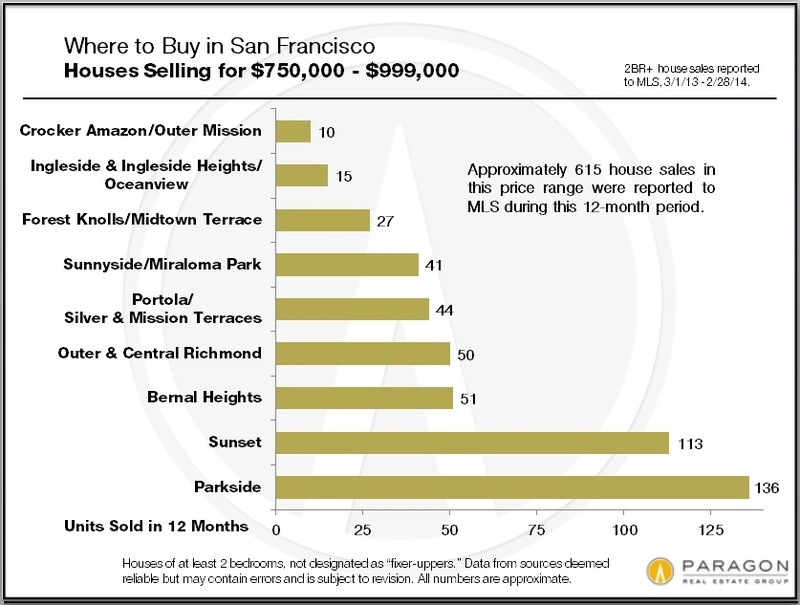 If we looked closer at the sales in the $2 million to $5 million, we’d find the higher end of the range dominated by Realtor District 7, the Pacific Heights-Marina area, the most expensive house market in the city. Though District 5 does see sales in the $3.5 to $5+ million range, most of its luxury houses sell between $2 million and $3.5 million. There are several other significant areas for these high-end houses, such as Lake Street/Sea Cliff, St. Francis Wood/Forest Hill and Lower Pacific Heights. Most luxury houses in the city were built in the period between 1905 and 1950, reflecting the era of construction dominating these neighborhoods of San Francisco — and a gracious, elegant era it was. However, there are a small number of big, new houses built each year, as well as some beautiful fifties houses scattered here and there, and, of course, many of the older houses have been extensively renovated over the years. 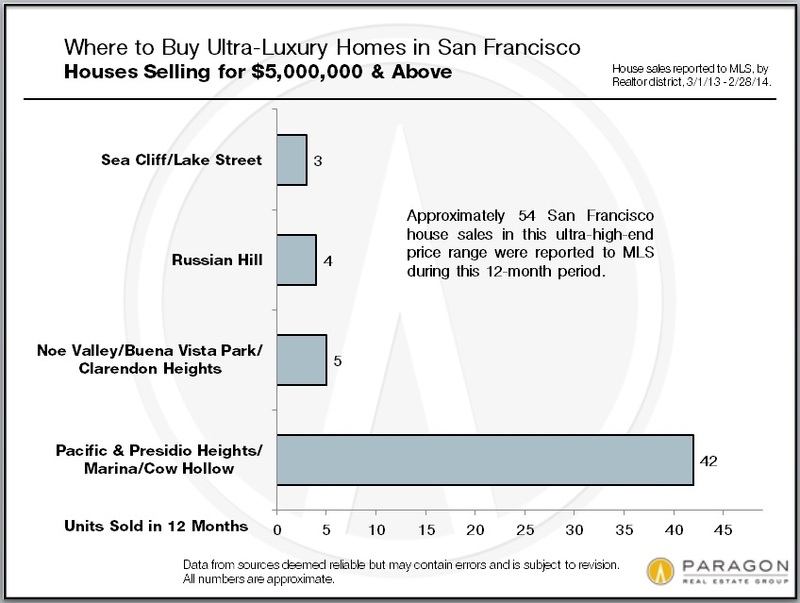 And, as illustrated below, at the very top of the luxury house market, the district of Pacific & Presidio Heights, Cow Hollow and Marina completely dominates sales. Here mansions can sell for up to $20 million or $30 million. Houses in Russian Hill are also exceedingly expensive, but there are very few houses in that area: Russian & Nob Hills are dominated by high-end condos and co-ops. 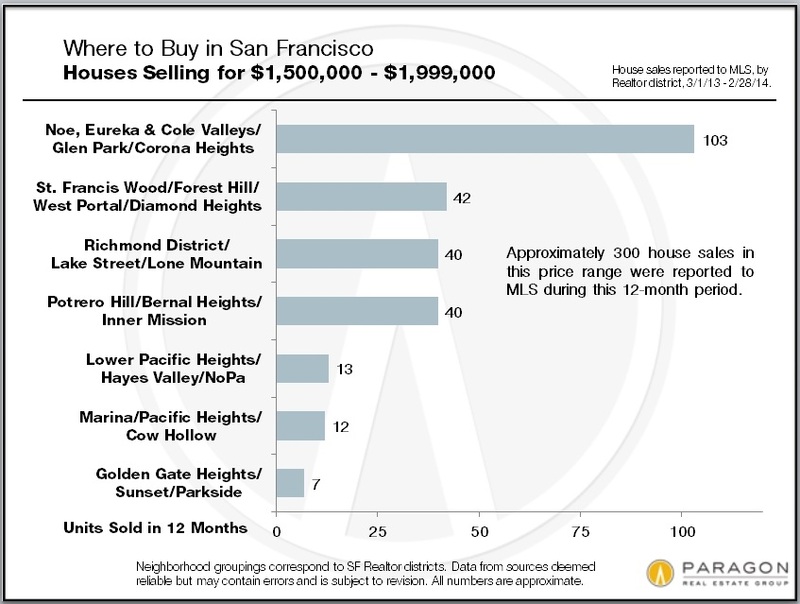 Two additional house sales (both listed by Paragon) in the $5 million to $7 million range closed in Noe Valley in the first half of March 2014 (after the time period of this analysis) — another indication of what’s happening there, often driven by young, high-tech wealth. It should be noted that a fair percentage of these ultra high-end home sales occur privately, outside of MLS, and are not reflected in this chart.